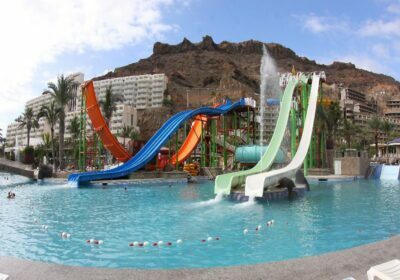 Paradise Taurito Valle Aquapark Free Child Places Low Deposit Family Holidays @ Web2travel Deals. Finding the Best Value Holidays to Costa Taurito, Gran Canaria from UK airports. 3 Star. The 3 star Paradise Taurito Valle Aquapark is also called Paradise Lago Taurito Aparthotel and Aquapark by some Tour Operators. Book Your Package Holiday Online Now direct with Top Tour Operator to claim your Free Child Place. Playa Taurito, Gran Canaria Free Child Places Low Deposit Family Holidays @ Web2travel Deals. Finding the Best Value Holidays to Gran Canaria from UK airports. Comparison: The Paradise Taurito Valle Aquapark is different from other accommodation in Taurito because. The central location of the Paradise Taurito Valle Aquapark means that everything is on your doorstep and you can walk to shops, bars and the beach. Good: Rooms are very large with a large balcony. Food is quite good quality. Good Variety of different foods and sweets everyday. Friendly staff. Great entertainment team for kids, and plenty to do. Drinks were readily available all day, loads of Ice cream, soft drinks and snacks for kids for all to eat. Good range of facilities including restaurants, shop, mini market, children play ground, pool towels, baby corner in the restaurant and baby sitting (upon request). The spa and wellness area with gym, beauty parlor, massage rooms, sauna, steam bath, gymnasium, fitness and cardio fitness. Rooms quite basic but regularly cleaned. Double Rooms have bathroom with shower or bath and balcony, with sea views and overlook pool/aquapark. Family Room then have a lounge area and an “extra balcony” added to existing one. Very quiet at night. Close to good beach (5 mins on bus) at Playa Mogan. Beach at Taurito is black sand and quite small. Not suitable for children to swim due to strong currents. Bad: Pool was quite small for size of hotel (but there is a saltwater water park on site). Not really anything bad to say about this property. Ideal for: The Paradise Taurito Valle Aquapark is ideal for Families with Small Children or Couples (outhwith school holiday periods) who want a really nice, peaceful place to stay. The Paradise Lago Taurito Aparthotel & Aquapark is situated in the picturesque area of Puerto de Mogan and is situated just one minute from the beach (50 metres) and six minutes by car from Puerto de Mogan. It is also within easy reach of Puerto Rico and Playa del Ingles which can be reached by bus or taxi. The hotel is positioned next to the Lago Oasis Water Park. Gran Canaria Airport (LPA) is approximately 61 km from the resort of Taurito. Find the Best Deals, Holidays and Free Child Places for the 3 star Altamar Aparthotel with Web2travel.co.uk. Easy Online Booking Since 2000. If you are planning a family holiday Free Child Places may already be sold out at this hotel. However for only £240 (family of 4) you can secure great value holidays for departures from Northern England, Northern Ireland and Scottish Airports. The 3 star all inclusive Lago Taurito Aparthotel and Aquapark, hotel has a great selection of amenities, making this an ideal choice for all the family. Restaurants can be found nearby to the complex, as well as the beach with scuba- diving, water- skiing and jet ski hire. The Paradise Taurito Valle Aquapark offers guests a heated swimming pool. Taurito is not the resort for you if you like to walk, although there are plently of buses to larger resorts, including Maspalomas where you can walk for miles, as the dunes extend into Playa Del Ingles. Overall the Paradise Taurito Valle Aquapark offers an excellent value for money holiday location. Booking: You can book the the Lago Taurito Aparthotel and Aquapark with many companies.